Wolfgang Amadeus Mozart , composer, violinist and piano virtuoso, was born on January 26, 1756 in Salzburg, Austria and died on December 5, 1791 in Vienna, Austria. 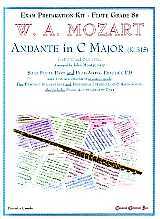 Mozart wrote Andante in C Major (K. 315) in 1778 for wealthy amateur Ferdinand Dejean (1731-1797), as part of a commission of Flute Quartets (for flute and string trio - violin, viola and cello) and Concertos, supposedly as a replacement for the 2nd movement of Concerto No. 1 in G Major (K. 313) - because Dejean found the original 2nd movement too difficult. This work was originally in the meter of 2/4; all of the rhythmic values have been doubled and the meter changed to 4/4 to make the tempo indication Andante (a walking speed) seem more appropriate. The suggested tempo is quarter = 92 ; however, some major players (Jean-Pierre Rampal & James Galway) have recorded the work at much slower tempos (quarter = 76 and 66). Cadenza A cadenza is a “solo within the solo” - the orchestra stops and only the soloist plays - providing the transition from the tonic six-four chord (2nd inversion of C major) to dominant 7th. In the Classical period, the soloist was expected to provide his own cadenza, basing it upon thematic material in the work and his own virtuosic abilities - a short cadenza has been provided.